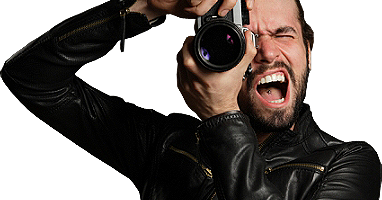 Summer is back so we continue early morning Prague private city tours with guide-photographer. Today we were wandering along the streets together with our new friends – Julia and Alexis. Have a look at the places of attraction and photos form the tour. We start all our individual excursions in Prague from Wenceslas Square, right from the statue of St. Wenceslas on his horse, which is situated in the upper part of the square in front of the National Museum. In general, Vaclavak is considered to be a place for meetings. Most people associate the square with Christmas markets and Christmas tree draped in a blaze of lights. 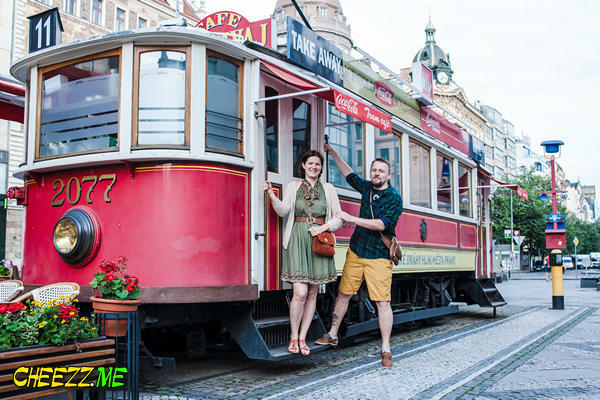 Attention of all the tourists who go to Wenceslas Square is caught by the café Tram. It’s a real authentic tram of the very first model. 30 years ago trams like this were a popular means of public transport in the city and toady such once by located in the very heart of Prague. Some of tourists sometimes get confused, since from the distance it seems that the trams are operating. 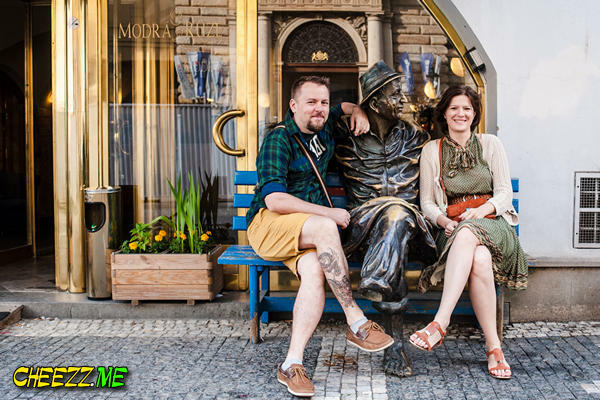 By the way, if you are a romantic person and are looking for the place to stay in Prague, we can advise you Hotel Modra Ruze. 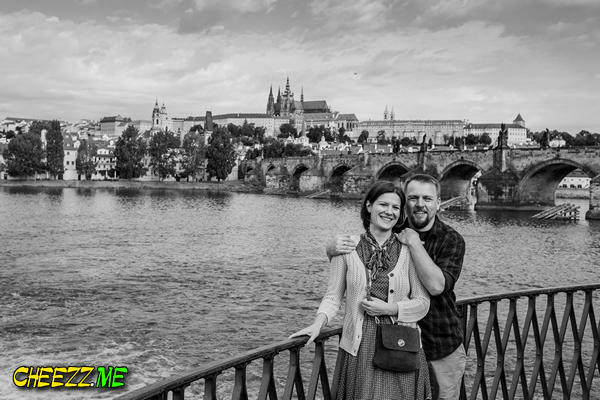 A lot of our tourists choose this variant of stay in Prague because of its central location, quite silent street and accessibility to main of attractions and places of interest. To book this great hotel in Prague, just follow the link. In the picture above you can see a monument of typical Czech local citizen siting on a bench and enjoying the views. It’s a very rare occasion when such sights in Prague as the Old Town Square as well the Charles Bridge are empty. But still there are periods of time complete peace and harmony. 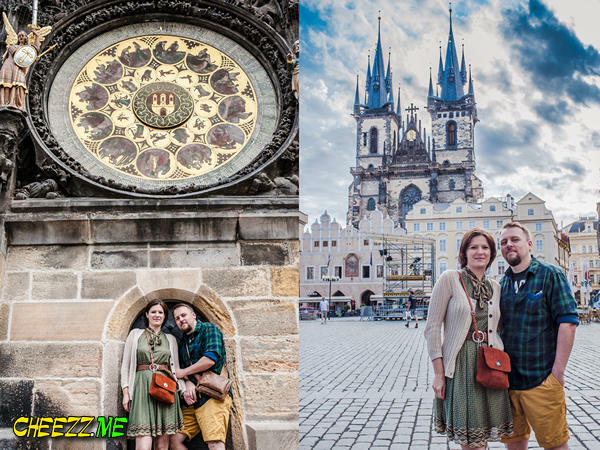 You can find thousands tourists near the Astronomical Clock Orloj every day. Every hour you can become a witness of a performance starring the figures of the Apostles and golden cockerel. And the best time to discover these attractions is early morning, when our individual city tours take place. In the eastern part of the Old Town Square there’s Tyn Church which is one of the most popular and recognisable attraction depicted in most postcards. The next point of our excursion was the Charles Bridge — real treasure for local people as well as for tourists. 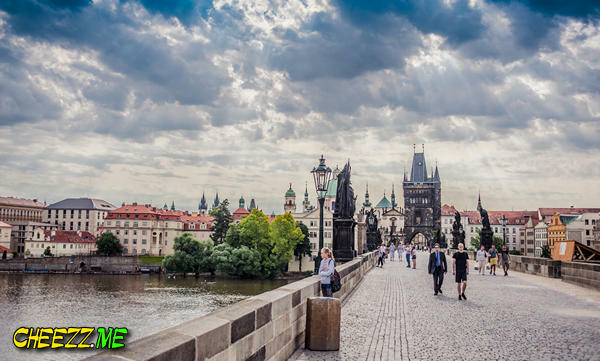 The Bridge was founded on July, 9. in 1357 at 5:31on by Charles IV and played a key role in the economic development of the Czech capital. Nowadays it is the attraction listed in every touristic guide as number one in Prague to visit. And we absolutely agree that this very place should be visited at least two-three times during you stay in Czech capital. First visit should be made early in the morning, when crowds don’t disturb and annoy you. This is the best way to feel the true ambiance of the most popular bridge. It has remained the longest stone bridge in the world for more than 500 years. At the end of the 19th century it was destroyed because of the heavy flood. 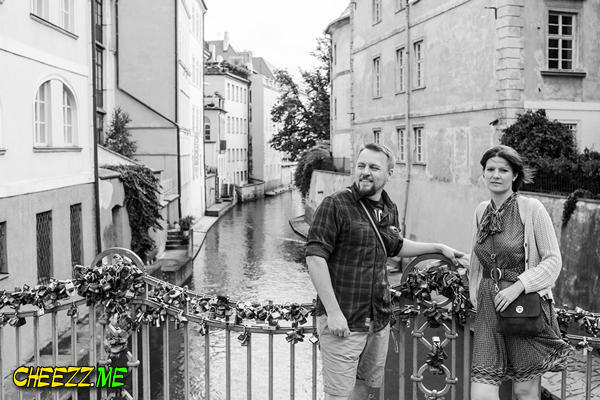 Kampa is a fantastic and romantic part of the city usually named as Venice in Prauge. Of course this river has nothing to do with the Italian Venice, but it can’t be denied that the water and buildings situated right by the side of it attract travellers and inspire photographers to make excellent photos in this very place. We also included this very part of the city into our agenda. «Old Town» of Prague is located on both sides of the river. Though each area has its own name, the old houses and tiny streets which actually create atmosphere can be found everywhere in the centre. We experienced some fantastic views in Mala Strana. Just around the corner from Charles Bridge one can find another top attraction of the city. 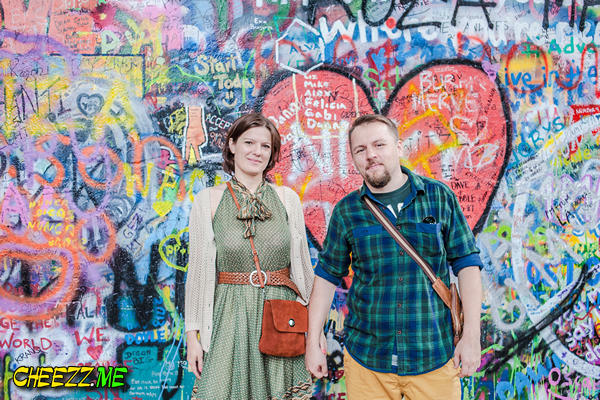 It is Lennon Wall in Prague. No need to describe the atmosphere of the place. One should just come here and see, enjoy and paint something on the wall, seen everyone can leave a message on it. To wind up with so to say lower city, we came to the river side where snow-white swans live all the year round. Even in winter they stay here, since the river doesn’t get frozen. Another reason for comfortable living of the swans in Prague is the amount of food tourists and locals bring them every day. So not to miss the opportunity to take some photos with these lovely birds with background of Charles Bridge, we stopped there for a while during our city tour. Where to feed swans in Prague? Three hours flew by and the individual excursion with a guide, a friend and a photographer was coming to an end. The very last place to visit was Prague Castle. This is the area located on the top of the hill, which can be seen from lots of places in the very centre of the city. The castle serves as the residence of President and Cabinet of Ministers. 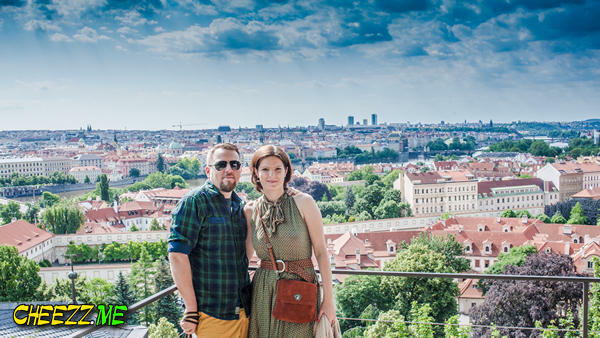 Also it is a perfect and very interesting attraction for tourists, since from the hill one can spot the whole «Old town» of Prague: red roofs, the river, the bridges and sharp picks of churches. This individual tour with guide-photographer in Prague took us about 4 hours. As a result all the top attractions were visited and discussed. And what is more important sweet memories of touring the city were reflected in the pictures. Which is another reason of combining an excursion with a photo shooting. To book a tour, please fill out the contact form.